Genetics (from Ancient Greek γενετικός genetikos, "genitive" and that from γένεσις genesis, "origin"), a discipline of biology, is the science of genes, heredity, and variation in living organisms. 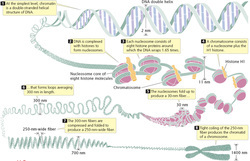 Genetics deals with the molecular structure and function of genes, gene behavior in context of a cell or organism (e.g. dominance and epigenetics), patterns of inheritance from parent to offspring, and gene distribution, variation and change in populations,such as through Genome-Wide Association Studies. Given that genes are universal to living organisms, genetics can be applied to the study of all living systems, from viruses and bacteria, through plants and domestic animals, to humans (as in medical genetics). The fact that living things inherit traits from their parents has been used since prehistoric times to improve crop plants and animals through selective breeding. However, the modern science of genetics, which seeks to understand the process of inheritance, only began with the work of Gregor Mendel in the mid-19th century. Although he did not know the physical basis for heredity, Mendel observed that organisms inherit traits via discrete units of inheritance, which are now called genes. Genes correspond to regions within DNA, a molecule composed of a chain of four different types of nucleotides—the sequence of these nucleotides is the genetic information organisms inherit. DNA naturally occurs in a double stranded form, with nucleotides on each strand complementary to each other. Each strand can act as a template for creating a new partner strand. This is the physical method for making copies of genes that can be inherited. The sequence of nucleotides in a gene is translated by cells to produce a chain of amino acids, creating proteins—the order of amino acids in a protein corresponds to the order of nucleotides in the gene. This relationship between nucleotide sequence and amino acid sequence is known as the genetic code. The amino acids in a protein determine how it folds into a three-dimensional shape; this structure is, in turn, responsible for the protein's function. Proteins carry out almost all the functions needed for cells to live. A change to the DNA in a gene can change a protein's amino acids, changing its shape and function: this can have a dramatic effect in the cell and on the organism as a whole. Although genetics plays a large role in the appearance and behavior of organisms, it is the combination of genetics with what an organism experiences that determines the ultimate outcome. For example, while genes play a role in determining an organism's size, the nutrition and health it experiences after inception also have a large effect. The laws of inheritance were derived by Gregor Mendel, a 19th-century Austrian priest-monk conducting hybridization experiments in garden peas (Pisum sativum). Between 1856 and 1863, he cultivated and tested some 29,000 pea plants. From these experiments, he deduced two generalizations which later became known as Mendel's Principles of Heredity or Mendelian inheritance. He described these principles in a two-part paper, Experiments on Plant Hybridization, that he read to the Natural History Society of Brno on February 8 and March 8, 1865, and which was published in 1866. Mendel's conclusions were largely ignored. Although they were not completely unknown to biologists of the time, they were not seen as generally applicable, even by Mendel himself, who thought they only applied to certain categories of species or traits. A major block to understanding their significance was the importance attached by 19th-century biologists to the apparent blending of inherited traits in the overall appearance of the progeny, now known to be due to multigene interactions, in contrast to the organ-specific binary characters studied by Mendel. In 1900, however, his work was "re-discovered" by three European scientists, Hugo de Vries, Carl Correns, and Erich von Tschermak. The exact nature of the "re-discovery" has been somewhat debated: De Vries published first on the subject, mentioning Mendel in a footnote, while Correns pointed out Mendel's priority after having read De Vries's paper and realizing that he himself did not have priority. De Vries may not have acknowledged truthfully how much of his knowledge of the laws came from his own work, or came only after reading Mendel's paper. Later scholars have accused Von Tschermak of not truly understanding the results at all. Regardless, the "re-discovery" made Mendelism an important but controversial theory. Its most vigorous promoter in Europe was William Bateson, who coined the terms "genetics" and "allele" to describe many of its tenets. The model of heredity was highly contested by other biologists because it implied that heredity was discontinuous, in opposition to the apparently continuous variation observable for many traits. Many biologists also dismissed the theory because they were not sure it would apply to all species. However, later work by biologists and statisticians such as R. A. Fisher showed that if multiple Mendelian factors were involved in the expression of an individual trait, they could produce the diverse results observed. Thomas Hunt Morgan and his assistants later integrated the theoretical model of Mendel with the chromosome theory of inheritance, in which the chromosomes of cells were thought to hold the actual hereditary material, and create what is now known as classical genetics, which was extremely successful and cemented Mendel's place in history. Mendel's findings allowed other scientists to predict the expression of traits on the basis of mathematical probabilities. A large contribution to Mendel's success can be traced to his decision to start his crosses only with plants he demonstrated were true-breeding. He also only measured absolute (binary) characteristics, such as color, shape, and position of the offspring, rather than quantitative characteristics. He expressed his results numerically and subjected them to statistical analysis. His method of data analysis and his large sample size gave credibility to his data. He also had the foresight to follow several successive generations (f2, f3) of his pea plants and record their variations. Finally, he performed "test crosses" (back-crossing descendants of the initial hybridization to the initial true-breeding lines) to reveal the presence and proportion of recessive characters. 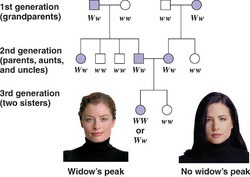 Non-Mendelian inheritance is a general term that refers to any pattern of inheritance in which traits do not segregate in accordance with Mendel’s laws. These laws describe the inheritance of traits linked to single genes on chromosomes in the nucleus. In Mendelian inheritance, each parent contributes one of two possible alleles for a trait. 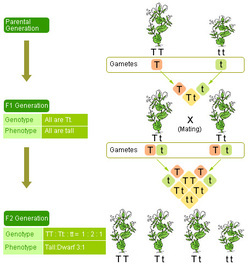 If the genotypes of both parents in a genetic cross are known, Mendel’s laws can be used to determine the distribution of phenotypes expected for the population of offspring. There are several situations in which the proportions of phenotypes observed in the progeny do not match the predicted values. Although inheritance of traits in fungi, viruses, and bacteria are all non-Mendelian, the phrase "non-Mendelian inheritance" is usually only used to describe the exceptions which occur in eukaryotic reproduction. Non-Mendelian inheritance plays a role in several disease processes. Extranuclear inheritance (also known as cytoplasmic inheritance) is a form of non-Mendelian inheritance first discovered by Carl Correns in 1908. 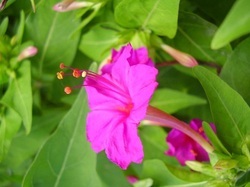 While working with Mirabilis jalapa Correns observed that leaf color was dependent only on the genotype of the maternal parent. Based on these data, he determined that the trait was transmitted through a character present in the cytoplasm of the ovule. Later research by Ruth Sager and others identified DNA present in chloroplasts as being responsible for the unusual inheritance pattern observed. Work on the poky strain of the mold Neurospora crassa begun by Mary and Hershel Mitchell ultimately led to the discovery of genetic material in mitochondria as well. According to the endosymbiont theory, mitochondria and chloroplasts were once free living organisms that were each taken up by a eukaryotic cell. Over time, mitochondria and chloroplasts formed a symbiotic relationship with their eukaryotic hosts. Although the transfer of a number of genes from these organelles to the nucleus prevents them from living independently, each still possesses genetic material in the form of double stranded DNA. It is the transmission of this organellar DNA that is responsible for the phenomenon of extranuclear inheritance. Both chloroplasts and mitochondria are present in the cytoplasm of maternal gametes only. Paternal gametes (sperm for example) do not have cytoplasmic mitochondria. Thus, the phenotype of traits linked to genes found in either chloroplasts or mitochondria are determined exclusively by the maternal parent. In humans, mitochondrial diseases are a class of diseases, many of which affect the muscles and the eye. Genetic linkage is the tendency of genes that are located proximal to each other on a chromosome to be inherited together during meiosis. Genes whose loci are nearer to each other are less likely to be separated onto different chromatids during chromosomal crossover, and are therefore said to be genetically linked. At the beginning of normal meiosis, a homologous chromosome pair (called a bivalent, made up of a chromosome from the mother and a chromosome from the father) intertwine and exchange sections or fragments of chromosome. The pair then breaks apart to form two chromosomes with a new combination of genes that differs from the combination supplied by the parents. Through this process of recombining genes, organisms can produce offspring with new combinations of maternal and paternal traits that may contribute to or enhance survival. This recombination of genes, called the crossing over of DNA, can cause alleles previously on the same chromosome to be separated and end up in different daughter cells. The farther the two alleles are apart, the greater the chance that a cross-over event may occur between them, and the greater the chance that the alleles are separated. The relative distance between two genes can be calculated by taking the offspring of an organism showing two linked genetic traits, and finding the percentage of the offspring where the two traits do not run together. The higher the percentage of descendants that do not show both traits, the farther apart on the chromosome the two genes are. Genes for which this percentage is lower than 50% are typically thought to be linked. Genetic linkage can also be understood by looking at the relationships among phenotypes. Among individuals of an experimental population or species, some phenotypes or traits can occur randomly with respect to one another, or with some correlation with respect to one another. The former is known as independent assortment. Today, scientists understand that independent assortment occurs when the genes affecting the phenotypes are found on different chromosomes or separated by a great enough distance on the same chromosome that recombination occurs at least half of the time. The latter is known as genetic linkage. This occurs as an exception to independent assortment, and develops when genes appear near one another on the same chromosome. This phenomenon causes the genes to usually be inherited as a single unit. Genes inherited in this way are said to be linked, and are referred to as "linkage groups". For example, in fruit flies, the genes affecting eye color and wing length are inherited together because they appear on the same chromosome. Viral populations do not grow through cell division, because they are acellular. Instead, they use the machinery and metabolism of a host cell to produce multiple copies of themselves, and they assemble in the cell. Attachment is a specific binding between viral capsid proteins and specific receptors on the host cellular surface. This specificity determines the host range of a virus. For example, HIV infects a limited range of human leucocytes. This is because its surface protein, gp120, specifically interacts with the CD4 molecule – a chemokine receptor – which is most commonly found on the surface of CD4+ T-Cells. This mechanism has evolved to favour those viruses that infect only cells in which they are capable of replication. Attachment to the receptor can induce the viral envelope protein to undergo changes that results in the fusion of viral and cellular membranes, or changes of non-enveloped virus surface proteins that allow the virus to enter. Penetration follows attachment: Virions enter the host cell through receptor-mediated endocytosis or membrane fusion. This is often called viral entry. The infection of plant and fungal cells is different from that of animal cells. Plants have a rigid cell wall made of cellulose, and fungi one of chitin, so most viruses can get inside these cells only after trauma to the cell wall. However, nearly all plant viruses (such as tobacco mosaic virus) can also move directly from cell to cell, in the form of single-stranded nucleoprotein complexes, through pores called plasmodesmata. Bacteria, like plants, have strong cell walls that a virus must breach to infect the cell. However, given that bacterial cell walls are much less thick than plant cell walls due to their much smaller size, some viruses have evolved mechanisms that inject their genome into the bacterial cell across the cell wall, while the viral capsid remains outside. Uncoating is a process in which the viral capsid is removed: This may be by degradation by viral enzymes or host enzymes or by simple dissociation; the end-result is the releasing of the viral genomic nucleic acid. Replication of viruses involves primarily multiplication of the genome. Replication involves synthesis of viral messenger RNA (mRNA) from "early" genes (with exceptions for positive sense RNA viruses), viral protein synthesis, possible assembly of viral proteins, then viral genome replication mediated by early or regulatory protein expression. This may be followed, for complex viruses with larger genomes, by one or more further rounds of mRNA synthesis: "late" gene expression is, in general, of structural or virion proteins. Viruses can be released from the host cell by lysis, a process that kills the cell by bursting its membrane and cell wall if present: This is a feature of many bacterial and some animal viruses. Some viruses undergo a lysogenic cycle where the viral genome is incorporated by genetic recombination into a specific place in the host's chromosome. The viral genome is then known as a "provirus" or, in the case of bacteriophages a "prophage". Whenever the host divides, the viral genome is also replicated. The viral genome is mostly silent within the host; however, at some point, the provirus or prophage may give rise to active virus, which may lyse the host cells. Enveloped viruses (e.g., HIV) typically are released from the host cell by budding. During this process the virus acquires its envelope, which is a modified piece of the host's plasma or other, internal membrane. Genealogical data can be represented in several formats, for example as a pedigree or ancestor chart. Family trees are often presented with the oldest generations at the top and the newer generations at the bottom. An ancestry chart, which is a tree showing the ancestors of an individual, will more closely resemble a tree in shape, being wider at the top than the bottom. In some ancestry charts, an individual appears on the left and his or her ancestors appear to the right. A descendancy chart, which depicts all the descendants of an individual will be narrowest at the top. Example of a fan chart family tree. The image of the tree probably originated with one in medieval art of the Tree of Jesse, used to illustrate the Genealogy of Christ in terms of a prophecy of Isaiah (Isaiah 11:1). Possibly the first non-Biblical use, and the first to show full family relationships rather than a purely patrilineal scheme, was that involving family trees of the classical gods in Boccaccio's Genealogia deorum gentilium ("On the Genealogy of the Gods of the Gentiles"), whose first version dates to 1360. 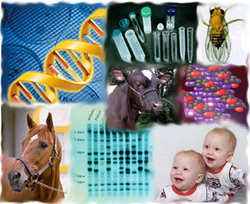 Bacterial genetics is the subfield of genetics devoted to the study of bacteria. Bacterial genetics are subtly different from eukaryotic genetics, however bacteria still serve as a good model for animal genetic studies. One of the major distinctions between bacterial and eukaryotic genetics stems from the bacteria's lack of membrane-bound organelles (this is true of all prokaryotes. While it is a fact that there are prokaryotic organelles, they are never bound by a lipid membrane, but by a shell of proteins), necessitating protein synthesis occur in the cytoplasm. Some bacteria also transfer genetic material between cells. This can occur in three main ways. First, bacteria can take up exogenous DNA from their environment, in a process called transformation. Genes can also be transferred by the process of transduction, when the integration of a bacteriophage introduces foreign DNA into the chromosome. The third method of gene transfer is bacterial conjugation, where DNA is transferred through direct cell contact. This gene acquisition from other bacteria or the environment is called horizontal gene transfer and may be common under natural conditions. Gene transfer is particularly important in antibiotic resistance as it allows the rapid transfer of resistance genes between different pathogens. Organisms have a vast array of ways in which their respective genomes are organized. A comparison of the genomic organization of six major model organisms shows size expansion with the increase of complexity of the organism. There is a more than 300-fold difference between the genome sizes of yeast and mammals, but only a modest 4- to 5-fold increase in overall gene number (see the figure on the right). However, the ratio of coding to noncoding and repetitive sequences is indicative of the complexity of the genome: The largely "open" genomes of unicellular fungi have relatively little noncoding DNA compared with the highly heterochromatic genomes of multicellular organisms. In particular, mammals have accumulated considerable repetitive elements and noncoding regions, which account for the majority of their DNA sequences (52% non-coding and 44% repetitive DNA). Only 1.2% of the mammalian genome thus encodes for protein function. This massive expansion of repetitive and noncoding sequences in multicellular organisms is most likely due to the incorporation of invasive elements, such as DNA transposons, retrotransposons, and other repetitive elements. The expansion of repetitive elements (such as Alu sequences) has even infiltrated the transcriptional units of the mammalian genome. This results in transcription units that are frequently much larger (30-200 kb), commonly containing multiple promoters and DNA repeats within untranslated introns. The vast expansion of the genome with noncoding and repetitive DNA in higher eukaryotes implies more extensive epigenetic silencing mechanisms. Studies of the genomic organization is thought to be the future of genomic medicine, which will provide the opportunity for personalized prognoses in clinics.